One Order Includes 8 pcs Tie Bars, Well Priced Set for Mens. Elegant Classic Design, Perfect Choices for Your Daily Wearing. Length 2.3 inch; width 0.23 inch, Gives You Comfortable Wearing Experience. Made of Quality Brass; Durable and Long-time to Wear. PRETTY FANCY CLASPS: Work well on various ties; Well finish and classic style; Simple and clean design. BASIC NECESSARY TIE BARS: Stay in place well when on the go or social dancing; Making great difference in both appearance and comfort. CLASSIC AND SIMPLE DESIGN: Dressy and of high build quality; Size 1.6*0.24 inch; Go the whole length of an average size tie. 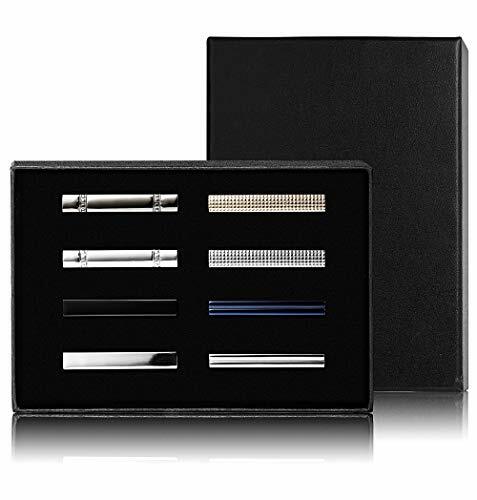 GOOD DEAL FOR GENTLEMEN: 8 Styles in One Set; Satisfy daily wearing; Nice colors to accentuate different color shirts.